For many businesses, Black Friday is the cornerstone of their fourth-quarter sales effort. Wanna know which brands won out, and which bombed this Black Friday past? 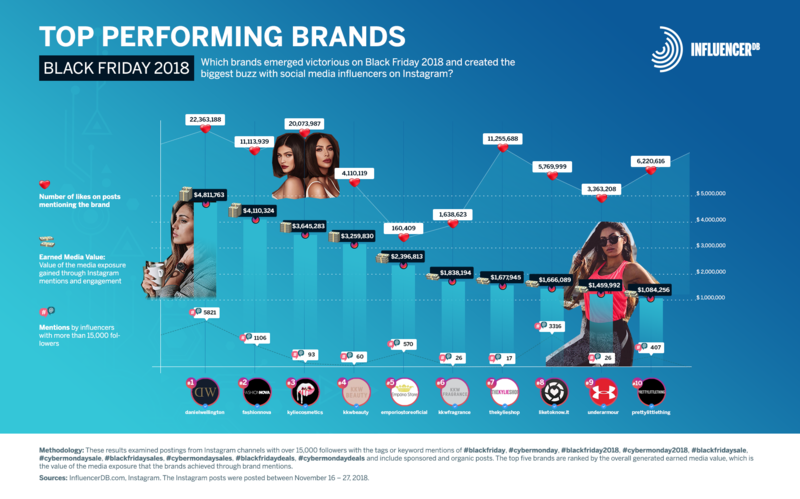 To provide some insight, InfluencerDB took a look at the top 10 performing brands on Instagram - and the results surprised even us. As expected, the list has a high concentration of beauty and fashion brands, however leading the pack this year was Daniel Wellington (DW) which unseated Fittea, last years top brand. DW achieved this by almost doubling its Earned Media Value (EMV) and engagement. Two other interesting highlights in the top 10 - FashionNova (a new comer to Black Friday in 2018) really pushed their influencer marketing activities during this time. Very much in-line with our findings in the Best Performing Brands Report we published earlier this year. And the Kardashian brands take up four of the top ten spots, with each brand delivering extremely high EMV, despite only a limited amount of mentions. The Kardashian’s leveraged each other, creating their own posts and tagging their brands. With huge audiences like that, they don’t need to do much more. One other brand worth highlighting is UnderArmour. Like Daniel Wellington, they stayed true to their brand identity - no Black Friday call out’s or links to sales in the bio’s, just beautiful engaging and aspirational content their followers love. If anything, these two brands provided a break from all the Black Friday noise. There was one brand originally listed in the top 10, (not mentioning names), that didn’t seem right so we did a little digging and let’s just say the engagement looked a little sketchy once again highlighting the importance of fighting fraud in influencer marketing. This disqualified them from making the top 10. In the end, the top 10 generated an EMV of around $26 Million this year, compared to approximately $16 Million in 2017, that’s a 62%+ increase! But don’t take my word for it, take a look at the chart below.